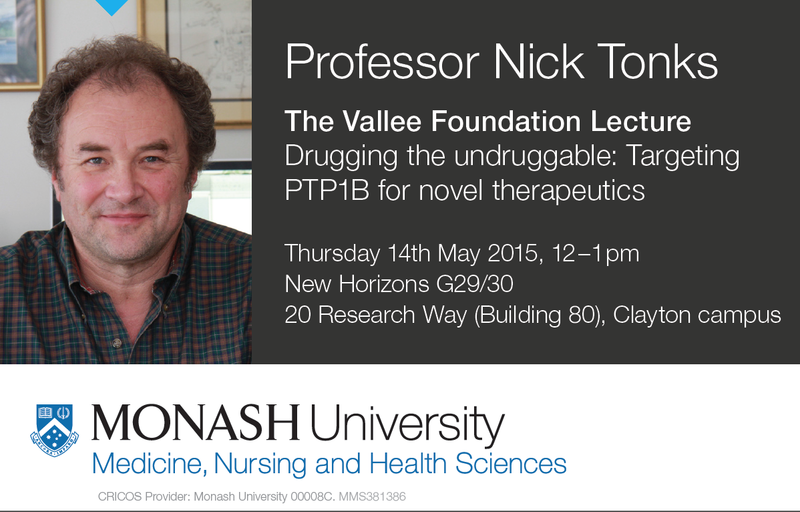 Nick Tonks (Cold Spring Harbor Laboratory) is just back from his Vallee Visiting Professor sabbatical. He spent the month of May 2015 at Monash University in Melbourne, Australia, where he was the guest of Professors Tony Tiganis, Roger Daly and John Carroll in the Departmeht of Biochemistry and Molecular Biology. Through informal conversations and formal events, including his Vallee Lecture on May 14 (Drugging the Undruggable: Targeting PTP1B for Novel Therapeutics), visits to labs and a conference on Cell Signaling and its Therapeutic Implications, Dr Tonks renewed friendships, forged new connections and collaborations, and enjoyed "the opportunity ... actually to think!" "When I was first informed that I had been selected as a Vallee Visiting Professor I was both honored and excited, but also concerned that it would be difficult to find the time to use this opportunity effectively. Now that I have completed the visit I can say without reservation that it was a wonderful experience. Melbourne is an outstanding place for biomedical research and it was beneficial to have an extended period of time to experience that environment in some depth. Furthermore, the potential collaborations that have arisen would never have occurred without this visit."